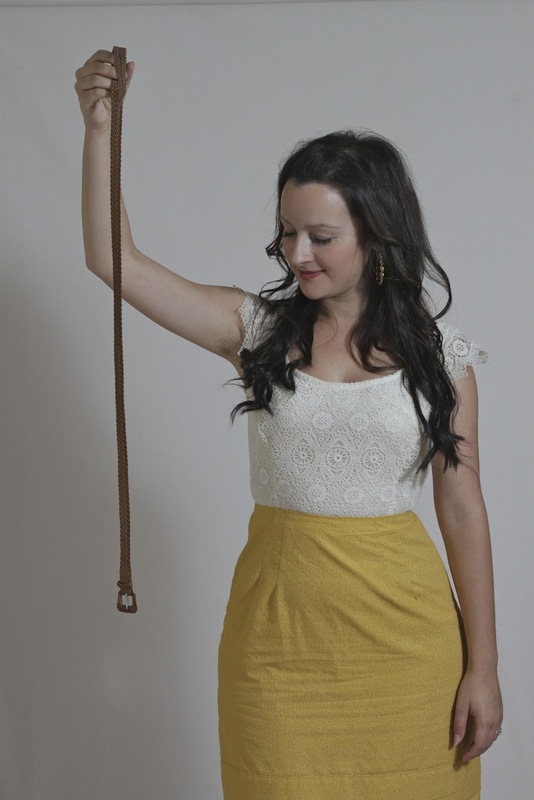 JuliaBobbin: Mustard and Lace Dress + Give Away Winner!! Mustard and Lace Dress + Give Away Winner!! If you can't eat it ... wear it. I recently found out that I'm not supposed to eat mustard. But nobody said I couldn't wear it. So I made me up a dress with a lace bodice and a mustard skirt. In your face nutrionists! Now before I get carried away with my ins and outs of my new fancy pants dress, let's talk Give Away. Oh yes. Congratulations! You are now the proud owner of 2 metres of pure silk Peau de Soie/Duchess Satin. I will be contacting you via email shortly. Ok, now that the balloons have been released from the ceiling let's talk latest dress. I made this dress using just over half a metre of stunning french lace that I bought from the Tessuti Fabric Store in Melbourne. They had just recently sent out an email to all us fabric addicts showing us their new stock of laces. Seriously I should just start getting HR at work to pay my wage directly into Tessuti's bank account. I am addicted to their fabrics and cannot stop myself from buying everything that comes into that store. Any way ... Here's a photo of some of their laces. Seeing those photos was like a starving man seeing a leg of lamb. My mouth started salivating and I started banging my head repeatedly against a wall. My husband thinks I'm like the self-punishing Dobby from Harry Potter. Which in my opinion is totally off; I never wear loin clothes. Much. 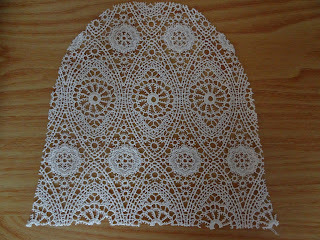 I love the pattern in this lace. A lot of laces you see now a-days have floral features on them (which I love). I found this pattern delicate and unique. 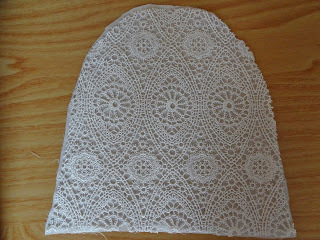 I featured the beautiful shaped edging by making little cap sleeves out of them. I underlined the bodice with a cotton lawn so that my bodice wasn't seethrough. Otherwise you would be able to see through to all my wires and buttons and discover my secret that I'm actually a robot (with feelings). 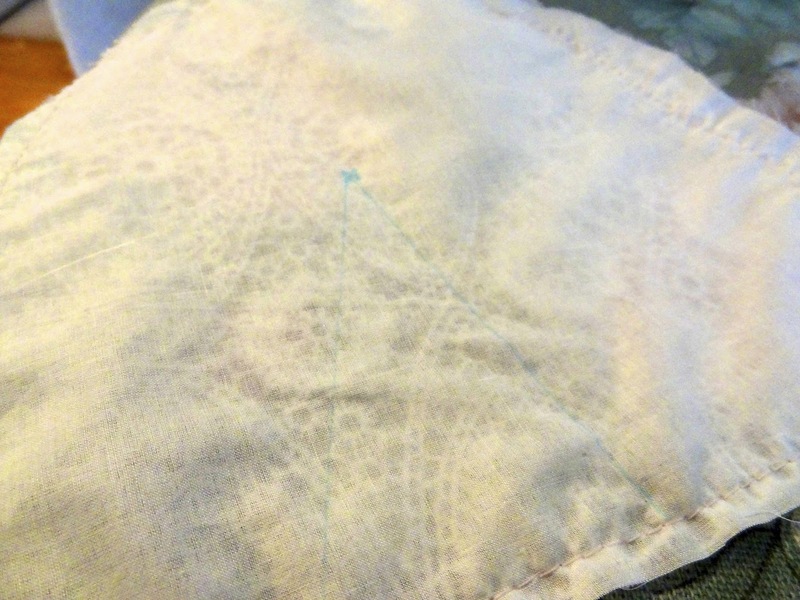 Underlining is great for giving fabric extra-support, drape or to stop a fabric being see-through. It can also help to bring out the colour in your fabric shell. 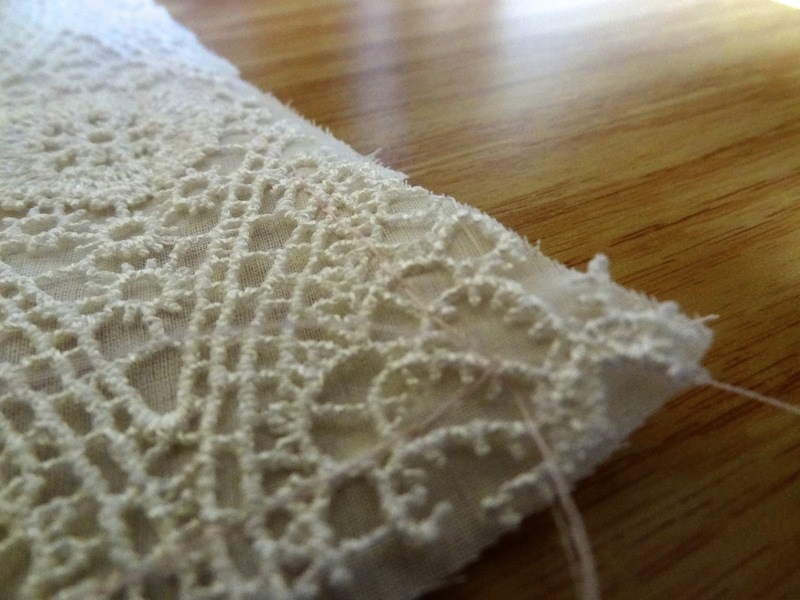 In my case it also stopped the loosely woven lace from stretching and changing it's shape as I sewed with it. For those of you that have never Underlined before, here's the deal-io. 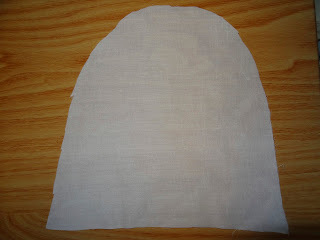 First, you cut out the identical pattern piece for both the shell and the underlining fabric. Typically the underlining is a lighter fabric than the shell but not always. 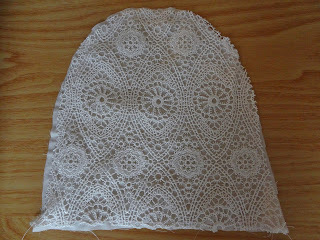 Here I've used a cotton lawn as the underlining and the fabric shell is lace. 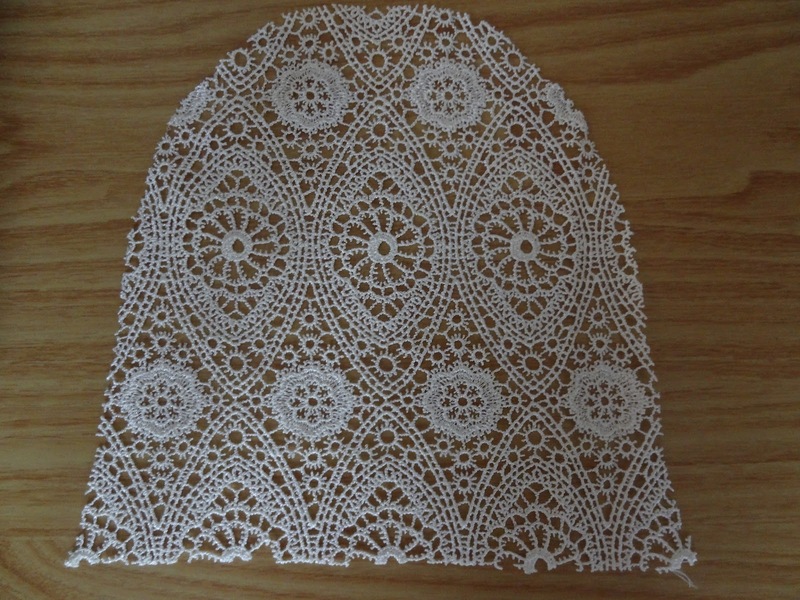 Look how naked the lace is! 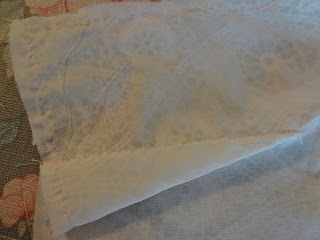 Then, you place the wrong side of the fabric shell (lace) onto the right side of the underlining fabric (cotton lawn). This means that both of the good sides of the two fabrics are facing up. Pin the shell to the interlining. Then carefully you baste the two fabrics together within the seam allowance using a long stitch. You can do this by hand or by machine. I used the machine for mine. I used a pink thread so you can see my stitches. 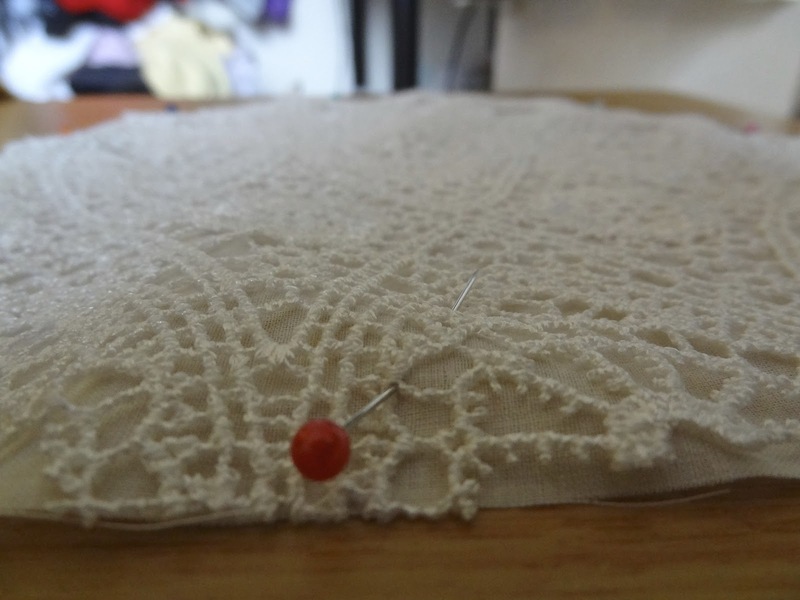 Once you have basted the two fabrics together the piece now acts as one piece of fabric. 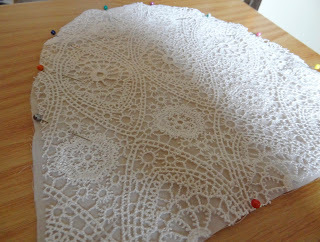 Now my lace is underlined and no longer see through! My example is a little wonky as I rushed it. Yours will look much neater I'm sure. You can then go ahead and make all your notches and markings on the wrong side of your underlined piece. Now when you do darts and pleats the two pieces of fabric are kept together and the folds are hidden at the back of the piece instead of being visible from the front. And there you have it. Doesn't that make it look neater?!! I made a scoop neck front and back because I love the shape of it. I then made up the skirt part of the dress in a quilting cotton that I found on special at Spotlight. Sold! it has tiny little white flowers in it that I find incredibly satisfying in an unexplained way. I lined the skirt (good girl Julia). I added two strips of fabric on the hem of the skirt also as a little feature for the bottom half of the dress. These strips were cut out and then folded in half so that they were self faced. I then attached them by machine onto the dress. 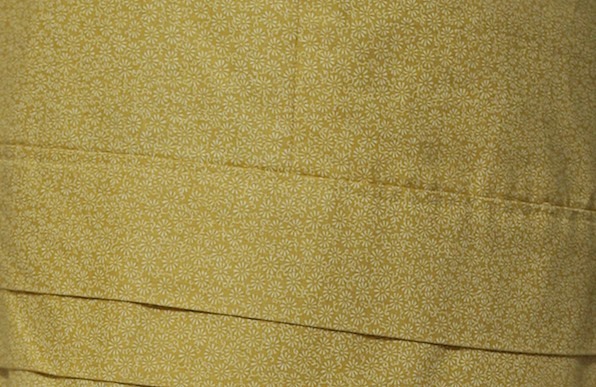 The skirt and the bodice are joined together at the waist, with an invisible zipper down the centre back. ...except on my dinner plate. Another beautiful dress Julia. I love the combination of the Lace and the small print on the skirt. Thanks Lisa! I too love the combination. 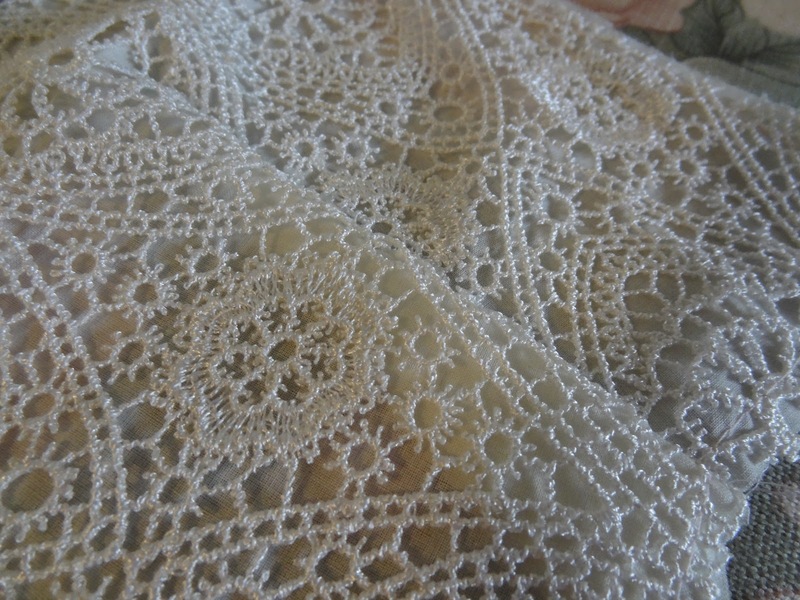 I'm so tempted to go and buy some more lace but it's hard to justify when my fabric stash is already so large! très jolie combinaison de tissus pour une robe parfaite. Ooh, what a great dress! I love white and mustard/gold together and the lace makes it that much more special. Thanks Dora! Yes lace always adds a touch of elegance to an outfit and it works so well with mustard. beautiful! 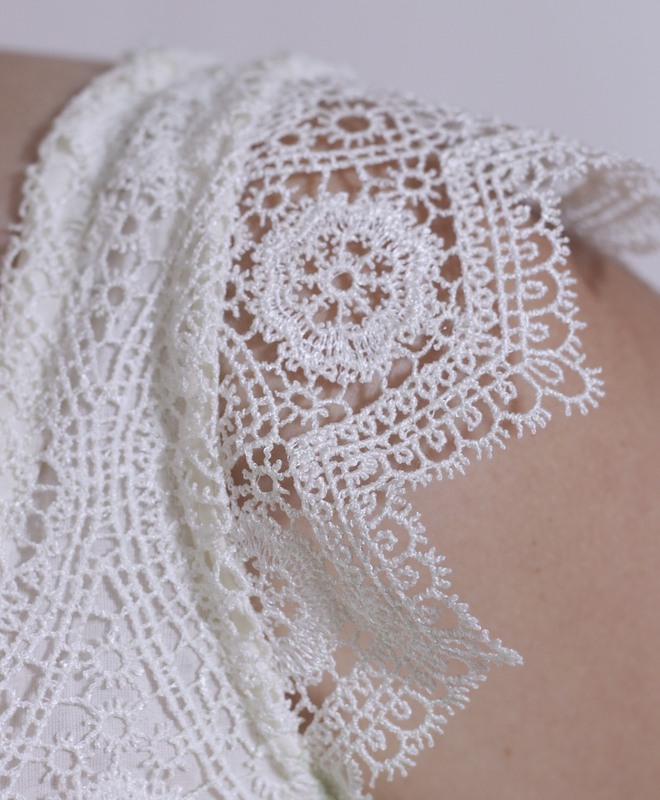 that lace is truly stunning! I'm very jealous of everyone that lives near a Tessuti store, poor me just has to lurk online! I do love a bit of an online lurk, let's be honest. But yes I feel very grateful to have such easy access to a Tessuti store. gorgeous!!! You've totally inspired me to try my first ever adult garment. Did you adapt this from a pattern? Yay! I hope you do Susan, they're very rewarding! This dress is a concoction of bits-and-pieces drafting or re-working of previous patterns that I've done over the last year that I've mashed together. The shape of the neckline is based on an old favourite of mine, Vogue pattern 1230. Love those pleats at the bottom. Congrats to Naomi she recommended your blog to me and now I am addicted!! Absolutely beautiful!! You have a great taste for fabric!! Why thank you! I do love me some nice fabric. I recently got rid of a whole lot of fabric from when I first started sewing and went nuts with fabric purchasing. I had not defined my taste then and it's quite amusing to look at what fabrics I first used to go for. you're a robot? I KNEW IT. i almost choked on my chicken bone when i saw those cap sleeves. I'm a big mustard fan. The colour though - I don't eat much of the condiment version! I'm loving the combo of the white and mustard :) And that lace is divine! 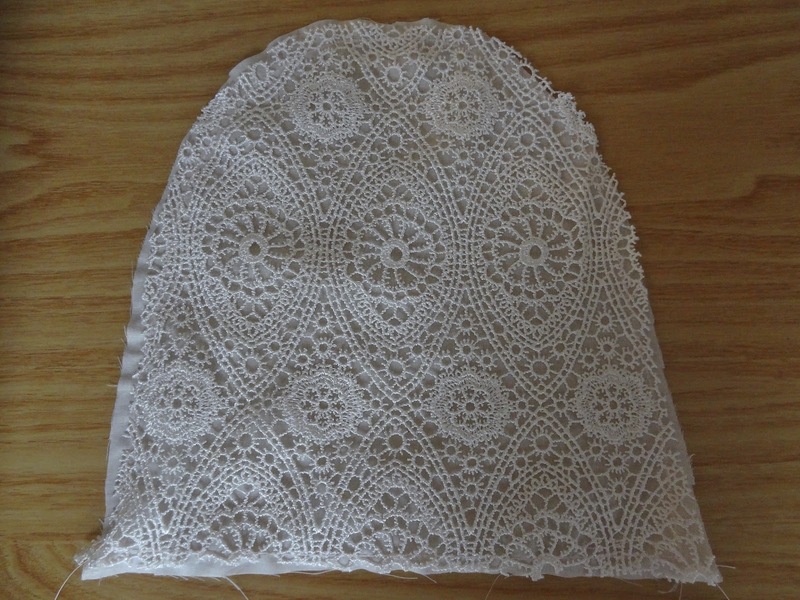 Thanks madam, you can't go wrong with Tessuti lace as you already know! There's so much I love about this dress I don't know where to begin - the sleeves, the lace, the little flowers, the hem.... awesome! Ooo thanks for the underlining tute. Thank you! 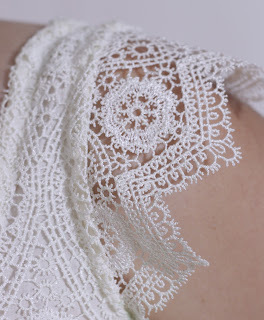 Yes the lace is so lovely. 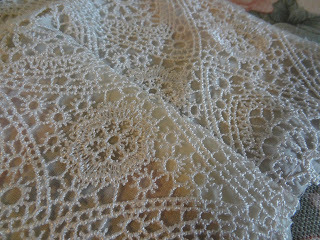 I just can't get enough of lace at the moment. Another lovely dress - you must have a great wardrobe! I muddled my way through making an underlined lace dress last year without really knowing what I was doing, so was very pleased to read this post and deduce that I did it right - yippee! Nice one Gabrielle! It's always nice when you discover you were doing something right all along! Ha! That's great! Thanks Jane, glad to be of help! Very pretty! I love the lace and I may need to borrow that hem idea. A simple but very cute touch. Nice dress! I love yellow! Another great project! Watched your you tube vids the other day, made me homesick hearing your accent! Look forward to your next creation. This dress is fantastic! The fit is superb. An inspiration. Wow thank you Lizzy! You're too kind! 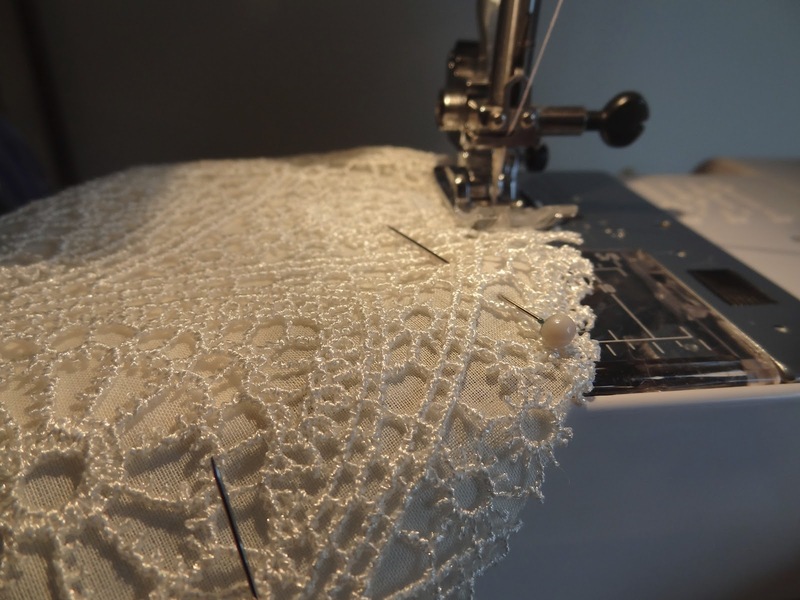 Your dress is lovely, and boy do I want to get my hands on this amazing lace, what a great store! Thanks Bri. Yes it is beautiful lace and the store is amazing. It's a lovely experience just walking in there. Lovely, one of my favorites so far! These colours are fabulous together. I love both lace and mustard colors,so of course I'm gonna love this dress. :) Perfect as always. Oh my gosh, this dress is gorgeous! Do you just love having a huge closet full of amazing dresses? My closet is at full capacity I can tell you that much! I'm going to need to do some serious culling. You know you've got too many much in your closet when hanging clothes in there actually creases the fabric because they are so squashed together! Oh my gosh, have you seen Cation Design's latest post? Anthropologie came out with a new line and one of their pieces is just like this! You must be some kind of trend predictor. Oh my goodness, thanks Hannah Jean! I love Anthropologie too! How exciting! Oh to be filthy rich so I could hire you to make all of my clothes. 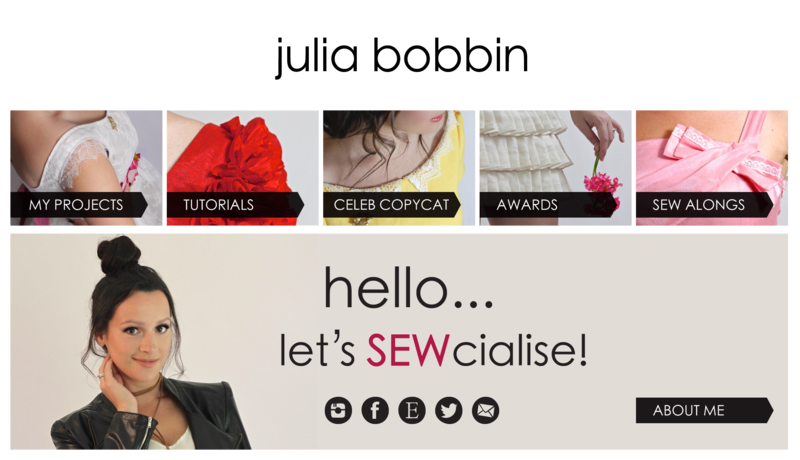 I love your style, blog, hair and... okay, I'm going to go and skulk over some chocolate and wish I had your talent for sewing. I've admired your work from afar for a while now, and this one compells me to comment. First off, I love your work, secondly, why on earth can you not have mustard???? Such beautiful lace . . . Such wonderful style ideas . . . Thanks for all the tips. Maybe you would share another secret -- about that zipper: what color(s) did you choose? Thanks Nina! I used an invisible zipper for this dress as the fabric was relatively light. I used a cream coloured zipper as I thought it best to match the bodice rather than the skirt.